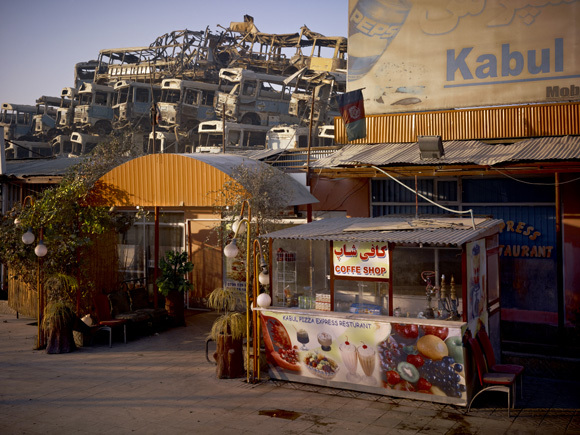 Simon Norfolk, Kabul ‘Pizza Express’ restaurant behind the Kabul municipal bus depot, 2011. Crawford Art Gallery is delighted to present Burke + Norfolk: photographs from the war in Afghanistan by John Burke and Simon Norfolk, April 20–June 30, 2012. In October 2010, Simon Norfolk began a series of new photographs in Afghanistan which takes its cue from the work of nineteenth-century Irish photographer John Burke. Burke (c.1843–1900) was the first photographer to make pictures in Afghanistan. He accompanied British forces during the invasion that became the Second Anglo-Afghan War from 1878–1880, producing albums of prints for sale. Virtually unknown today, Burke was a precursor of the contemporary photo-journalist producing work that went beyond reportage. His images do not reinforce British colonial values, but allow for a critical and nuanced reading of the relationship between the British forces and their Afghan peers. The exhibition marks the first time John Burke’s work has been shown in Ireland. Simon Norfolk (b. 1963) is an internationally acclaimed landscape photographer whose work over the last ten years has been themed around a probing and stretching of the meaning of the word ‘battlefield’ in all its forms. Norfolk’s photographs re-imagine or respond to Burke’s Afghan war scenes in the context of the contemporary conflict. Conceived as a collaborative project with Burke across time, this body of work by Simon Norfolk is presented alongside John Burke’s images. Rather than artificially restaging Burke’s compositions exactly, Norfolk identified contemporary equivalents, researching and travelling to Burke’s vantage points and developing a digital equivalent of his collodion wet plate technique. Norfolk finds many of the original locations of Burke’s work and conveys modern parallels with their subject matter depicting soldiers, bomb-sites, tented communities, alongside images of contemporary culture such as internet cafés and radar stations. The exhibition is accompanied by a short film by Simon Norfolk discussing his relationships with John Burke and contemporary Afghanistan. Burke + Norfolk originated at Tate Modern, London (2011). Simon Norfolk is shortlisted for this year’s prestigious Sony World Photography Award. Simon Norfolk has exhibited internationally including Exposed, Voyeurism, Surveillance and the Camera, San Francisco Museum of Modern Art (SFMOMA) and Walker Art Museum, Minneapolis (2011), Burke + Norfolk, Tate Modern, London (2011). In recent years he has shown at the Shanghai Art Museum, Russian Academy of Fine Arts, Moscow and the Imperial War Museum. He is shortlisted for the Sony World Photography Award 2012 and has received many awards for his work including The European Publishers Award for Photography; The Olivier Rebbot Award (Foreign Press Club of America) and The Infinity Award (ICP, New York). His work is in major public and private collections throughout the world. Thursday 19 April 2012 (6:15–8pm) with guest speaker Peggy Sue Amison, Artistic Director, Sirius Arts Centre. Simon Norfolk will discuss the exhibition and his practice on Thursday 19 April, 5:30pm.